The Sabre Design Team presents the latest design in a series of hard top express motoryachts. Elegant, traditional designs, luxurious accommodations and excellent performance are the hallmarks of the Sabre 38 Express. 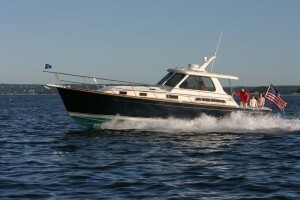 Quiet and economical to operate, the Sabre 38 will impress the most experienced yachtsman. The helm deck is a careful study in ergonomics. Surrounded by large opening windows and overhead hatches for maximum ventilation and light. Views for the helmsman and crew are virtually unobstructed. The Stidd helm and mate’s chairs, covered in Ultraleather upholstery, provide a degree of comfort rarely found in other boats. To add to cruising comfort, Sabre’s engineers have reduced noise and vibration levels substantially with a careful study of engine room ventilation and insulation. Wide side decks with large diameter stainless steel hand rails, standard rope chain windlass and highly polished aluminum hatches all add to the beauty and functionality of her deck. A large anchor roller makes anchoring work a breeze. An optional hard back enclosure closes off the helm deck from the cockpit with the addition of two elegant curved windows in the corners, a sliding window to port and an aluminum entry door. Below decks her hand-crafted cherry interior adds to the sense of luxury, evident throughout. The stateroom berth is low and wide, making it both comfortable and easy to access. A pocket door separates the salon and stateroom while the head with stall shower has private access from the stateroom and from the salon. The main salon is configured with a long L-shaped settee and, her maple-inlaid salon table drops to form a guest berth. A standard thin screen TV and DVD player are recessed in to the furniture of the main cabin bulkhead. Her well equipped galley offers an electric cook top, convection microwave oven and coffee maker as well as ample storage for extended voyages. 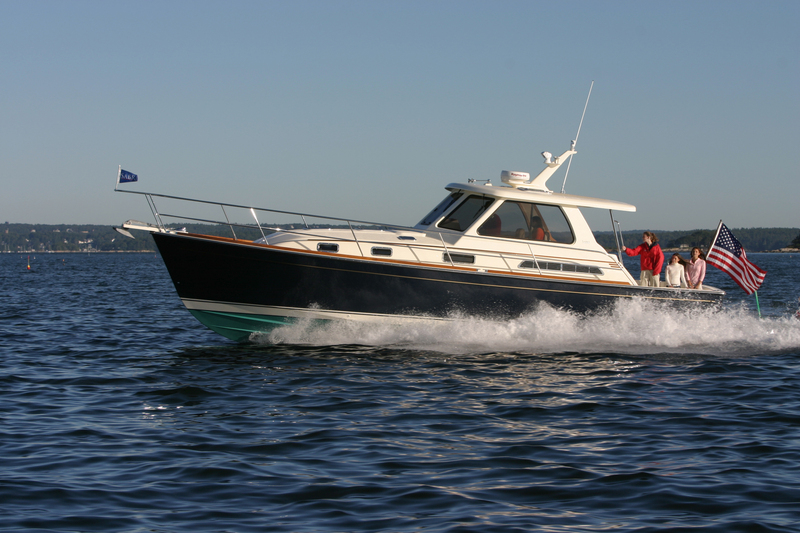 The Sabre 38 Hard Top Express is a yacht destined to become a classic for years to come.